Cleaning your computer and your computer components and peripherals helps keep the components and computer in good working condition and helps keep the computers from spreading germs. To the right is an example image of how dirty the inside of your computer case can get. This example is a dirty computer case fan. Depending on the environment that your computer operates in determines how often you should clean your computer case. The below list is our recommendation and may change depending upon your computer's environment. The frequency of how often you should clean your computer varies on several different factors. To help you determine how often you need to clean your computer we've created the below chart. Check each of the boxes below that apply to your computers environment to determine how often it should be cleaned. Based off what has been checked above you should be cleaning your computer every 11 months. Although many companies have created products to help improve the process of cleaning your computer and peripherals, users can also use household items to clean their computers and peripherals. Below is a listing of items you may need or want to use while cleaning your computer or computer peripherals. Keep in mind that some components in your computer may only be able to be cleaned using a product designed for cleaning that component; if this is the case, it will be mentioned in the cleaning tips. Cloth - A cloth is the best tool used when rubbing down a component; although paper towels can be used with most hardware, we recommend using a cloth when ever possible. Caution: We only suggest you use a cloth when cleaning components such as the outside of the case, a drive, mouse, etc. You should not use a cloth to clean any circuitry such as the RAM or motherboard since they can generate ESD that can damage electronics. Portable Vacuum - Sucking the dust, dirt, hair, cigarette particles, and other particles out of a computer can be one of the best methods of cleaning a computer. Over time, these items can restrict the airflow in a computer and cause circuitry to corrode. Do not use a standard vacuum as it can generate a lot of static electricity that can damage your computer. In addition to cleaning the drive with a special disc designed to clean drives users can also use a cloth dampened with water to clean the tray that ejects from the drive. Make sure however that after the tray has been cleaned that it completely dry before putting the tray back into the drive. See the CD cleaning recommendation for further steps on cleaning each of your CDs. Procedure: Cleaning CDs and DVDs should be done with a cleaning kit but can also be done with a normal clean cotton cloth or shirt. When doing this with a clean cotton cloth or shirt, wipe against the tracks, starting from the middle of the CD or DVD and wiping towards the outer side as shown in the below picture. Never wipe with the tracks; doing so may put more scratches on the disc. It is recommended when cleaning a CD that water is used. However, if the substance on a CD cannot be removed using water, pure alcohol can also be used. Why? While hard drives cannot be cleaned physically, they can be cleaned with various utilities on the computer to help it run fast and more efficiently. Utilizing these utilities will prevent the hard drive from slowing down. Why? Headphones that are used by multiple people may need to be cleaned frequently to help prevent the spreading of germs and head lice. Procedure: If the headphones being used are plastic or vinyl, moisten a cloth with warm water and rub the head and earpieces of the headphones. As mentioned earlier in our cleaning tips, it is recommended that if your headphones are being used for a library or school that you do not use any disinfectant or cleaning solvent as users may have allergic reactions to the chemicals they contain. Headphones that have cushions also have the availability of having the cushions replaced. Replacing these cushions can also help keep the headphones clean. Finally, in regards to headphones and the spreading of head lice, if multiple students are using your headphones, you should consider having the students use their own headphones, using bags that are placed over the headphones, or having headphones that can be wiped with warm water after each student has used the headphones. Many people clean the keyboard by turning it upside down and shaking. A more effective method is to use compressed air. Compressed air is pressurized air contained in a can with a very long nozzle. aim the air between the keys and blow away all of the dust and debris that has gathered there. A vacuum cleaner can also be used, but make sure the keyboard doesn't have loose "pop off" keys that could possibly be sucked up by the vacuum. If you wish to clean the keyboard more extensively you'll need to remove the keys from the keyboard. If anything is spilt onto the keyboard turn the computer off immediately or at the very least disconnect it from the computer. Once done quickly flip the keyboard over helping to prevent the substance from penetrating circuits. While the keyboard is upside down, shake the keyboard over a surface that can be cleaned later. While still upside down, use a cloth to help clean out what can be reached. After cleaned to the best of your ability leave the keyboard upside down for at least one night allowing it to dry. Once dry, continue cleaning the keyboard with any remaining substance. If after cleaning the keyboard you have keys that stick remove the keys and clean below the keys and the bottom portion of the key. Finally, if the keyboard still works but remains dirty or sticky before discarding the keyboard as a last resort try washing the keyboard in the dishwasher. If after doing all the above steps the keyboard does not function properly or at all it's recommended you buy a new keyboard. Why? Dirt, dust, and finger prints can cause the computer screen to be difficult to read. Procedure: Unlike a computer monitor, the LCD / flat-panel display is not made of glass, therefore requires special cleaning procedures. When cleaning the LCD screen it is important to remember to not spray any liquids onto the LCD directly, press gently while cleaning, and do not use a paper towel as it may cause the LCD to become scratched. To clean the LCD screen we recommend that you use a non-rugged microfiber cloth, soft cotton cloth, or Swiffer duster. If a dry cloth does not completely clean the screen, you can apply rubbing alcohol to the cloth and wipe the screen with the damp cloth. Rubbing alcohol is used to clean the LCD before it leaves the factory. Tip This section is for computer monitors if you have a LCD or flat-panel see the LCD cleaning section. Procedure: The glass monitor screen can be cleaned with ordinary household glass cleaner*. Be sure to remove power from the monitor and spray the cleaner onto a lint free-cloth so the fluid doesn't leak into the electrical components inside the monitor. Vacuum off any dust that has settled on top of the monitor, and make sure no books or papers have been placed on the air vents. Obstructed monitor vents can cause the monitor to overheat or even catch on fire. Warning We suggest using a cloth dampened with water when cleaning monitor on a screen that is not made of glass or has any anti-glare protection on the screen. Using ordinary household glass cleaner on special screens, especially cleaners with ammonia can remove anti-glare protection or other special surfaces. Another good alternative to compressed air is to use a portable battery powered vacuum that can effectively remove the dust, dirt, and hair from the motherboard completely and prevent it from getting trapped within the case. However, do not use a standard electricity powered vacuum as it can cause a lot of static electricity that can damage the computer. When using the vacuum it is vital that you stay a couple inches away from the motherboard and all other components to help prevent contact as well as to help prevent anything from being sucked into the vacuum. Ensure that you do not remove any small components with the vacuum such as jumpers. Tip When cleaning the inside of the case also look at any fans or heat sinks. Dust, dirt, and hair collects around these components the most. Why? A dirty optical-mechanical mouse (mouse with a ball) can cause the mouse to be difficult to move as well as cause strange mouse movement. Procedure: To clean the rollers of an optical-mechanical mouse, you must first remove the bottom cover of the mouse. To do this, examine the bottom of the mouse to see what direction the mouse cover should be rotated. As you can see in the below illustration, the mouse cover must be moved counter clockwise. Place two fingers on the mouse cover and push the direction of the arrows. Once the cover has rotated about an inch, rotate the mouse into its normal position, covering the bottom of the mouse with one hand and the bottom should fall off including the mouse ball. If this does not occur, attempt to shake the mouse gently. 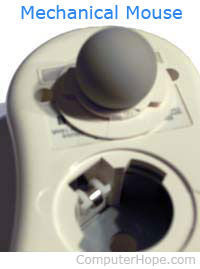 Once the bottom cover and the ball are removed, you should be able to see three rollers located within the mouse. Use a cotton swab, finger, or fingernail to remove any substance. Usually, there will be a small line of hair and dirt in the middle of the roller, remove as much as this substance as possible. Once you have removed as much dirt and hair as possible, place the ball back within the mouse and place the cover back on. If the mouse still appears to be having the same issue, repeat the above process; if after several attempts the mouse is still having the same issues, it's likely that your mouse has other hardware issues and we recommend that it be replaced. Why? To help keep a mouse clean and germ free it can be helpful to clean the mouse. Why? Cleaning the outside of a printer can help keep the printer's appearance looking good; and in the case of a printer that is used by many different people, keep the printer clean of germs. Why? With some printers it may be necessary to clean the inside of the printer to help keep the printer running smoothly. Procedure: Because of how many different printers there are, steps in cleaning printers, and printer manufacturer policies on cleaning the inside of the printer, we recommend you obtain the printer cleaning steps from your printer manufacturer. Why? Flatbed scanners commonly become dirty with dust, fingerprints, and hair. When a scanner is dirty, the images may have distortions. To clean the outside of the scanner, the same towel or cotton cloth can be used. Below are a listing of miscellaneous computer hardware that is rarely used today, but kept on this page for the few people who are working on older computers and need to clean these devices. Procedures: The floppy drive can be cleaned two different ways. The first method of cleaning a floppy drive, and our recommended method, is to purchase a kit at your local retail store designed to clean the read/write heads on your floppy drive. Why? It is recommended that the SuperDisk / LS120 drive be cleaned regularly to prevent drive heads from becoming dirty. Procedure: Purchase the SuperDisk cleaning kit available through Imation. Using any other method will void the warranty on your drive.